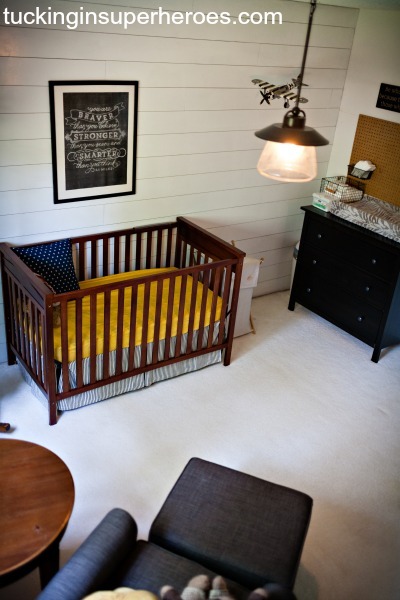 I realized the other day that I never did show off the final nursery for Kacher. 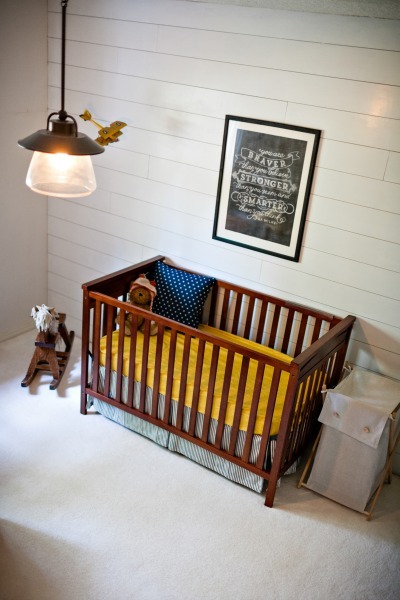 I wanted a vintage industrial feel for his room which was actually a closet when we moved in last year. Wait. That sounds bad. 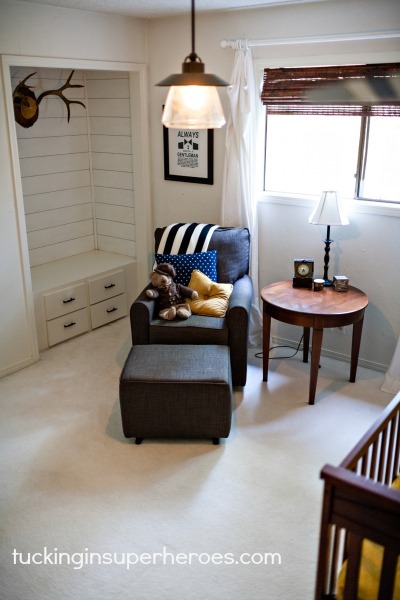 It was originally a room that the lady before us transformed into an entire closet for herself. We decided right away that it needed to be a room again and set about removing the shelves and rods. This left a mess on the walls of holes and whatnot and it remained that way until about 7 months later when we realized it was time to turn it into a nursery. 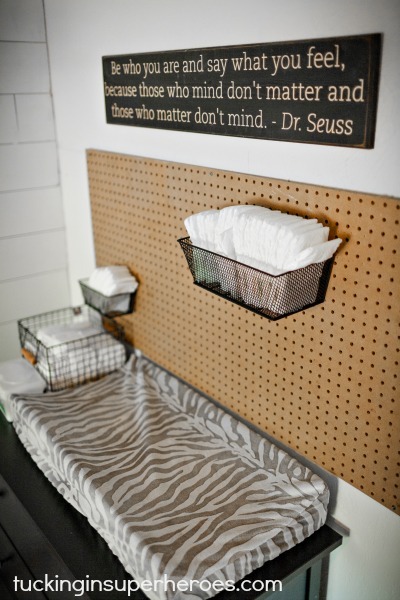 As I told you before with a tutorial, we planked the largest wall and the “closet” that is now a bench seat. 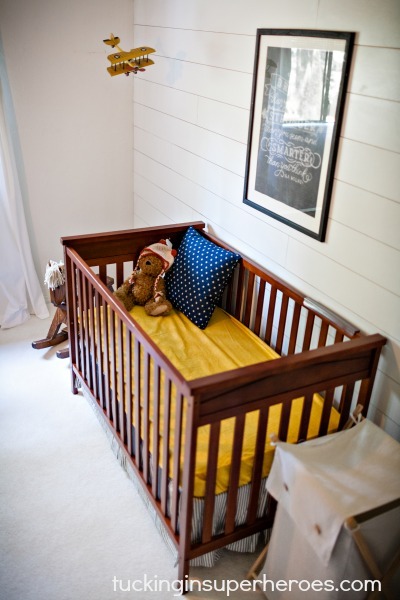 Without further ado, I give you Kacher’s nursery! 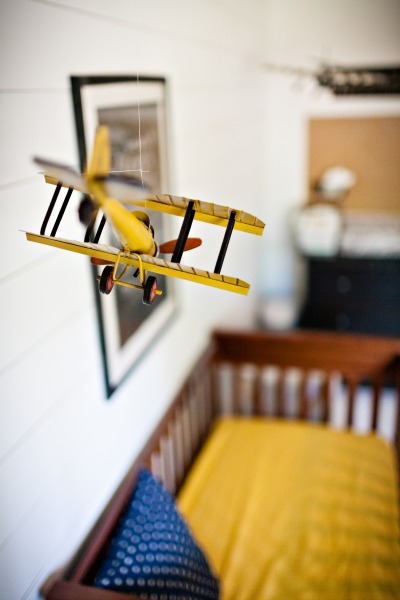 I saved the antique looking airplanes that I bought at Homes Goods years ago and had in Carter’s last room and used them here hanging above the crib with fishing line. We replaced an outdated light with a new one from Lowe’s. The glider was a splurge from Babies R Us with a 25% off coupon. Man, I wish we had splurged on one with baby #1. Why we waited until #4 I have no idea. This thing is straight from heaven. The teddy bear was mine when I was little. Such a little gentlemen! I’m glad that I kept him all these years. He just looks like he was meant for little man’s nursery. 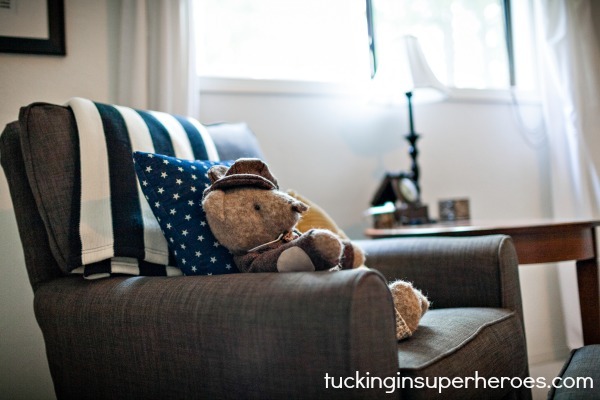 The striped blanket is an IKEA find and I throw it in with a starry pillow found at an antique shop. 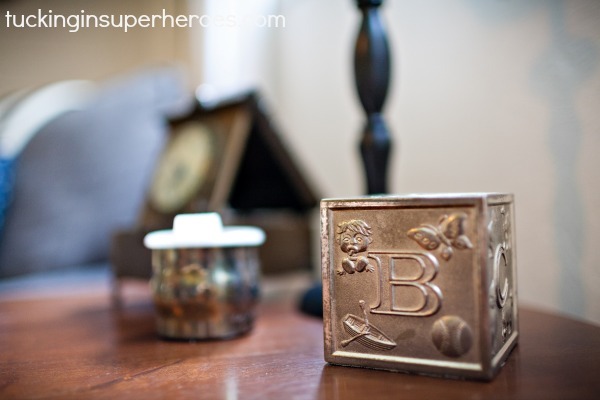 I love that Chris’ mom saved some of his treasures as well. His sippy cup and piggy bank are proudly displayed and go perfectly with the theme. 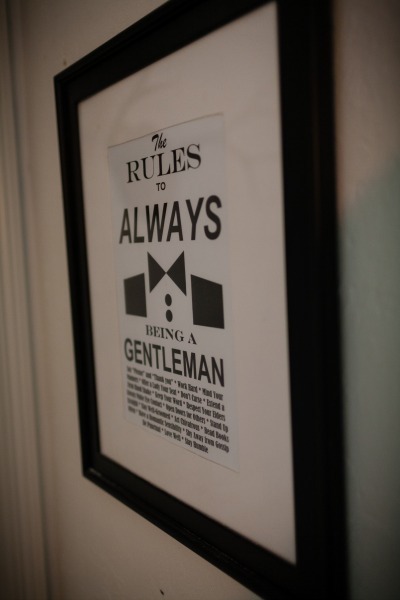 The rules to always be a gentlemen came from Carter’s last room as well. No need to re-buy if you can recycle! And that’s about it. Simple, but sweet. 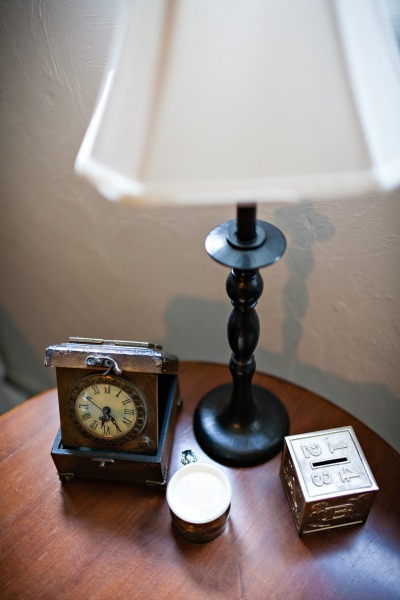 Vintage with a touch of manly. Love this so much!!! Heather, some day you and my daughter in love are going to be fast friends!! You both have such clever and fun ideas! Your family of young men are blessed, indeed!